Without overtly stating his purpose, Cecil Foster—ex-Barbadian journalist, novelist, cultural critic, and now professor—who immigrated to Canada in 1979 at age 28, has devoted two of his books: Sleep on, Beloved (1995) and A Place Called Heaven: The Meaning of Being Black in Canada (1996), to exploring why Canada’s Blacks feel shut out of Canada’s much heralded multiculturalism. A third book, Where Race Does Not Matter: The New Spirit of Modernity (2005), documents, among its other functions, Canada’s racist heritage, for which multiculturalism is still largely an unsuccessful corrective. In the works of Foster that I focus on here—the novel Sleep on, Beloved and A Place Called Heaven: The Meaning of Being Black in Canada—one might see Toronto as metonym, a microcosm of sorts, for the rest of Canada. If we add Foster’s memoir Island Wings (1998) to these works, the metonym extends to Britain and to the United States, the countries to which Caribbean Blacks have immigrated in large numbers. Sleep on, Beloved depicts the destruction of a Black Toronto family and the resulting pathology on the members of that family. How Blacks resist such destruction is Foster’s central preoccupation in the essays comprising A Place Called Heaven. My essay focuses on the pathology and alienation of Blacks in Cecil Foster’s fictional Toronto. I complement my analysis of Sleep on, Beloved with information from A Place Called Heaven and use the latter to provide a context for the former. The exigencies of form—the novel and the essay—notwithstanding, I do not feel that this approach distorts Foster’s intentions inasmuch as he states that the single most important goal of his writing is to faithfully record and interpret reality to the best of his ability (Why We Write, 103). It is worth noting too that in A Place Called Heaven Foster’s sense of life, which forms the psycho-epistemological foundation for his works, is expressed in minute detail. Underlying my analysis is the notion that place, unless the artist is inept, is always a major trope. I begin with Foster’s analysis of why institutions like the African-Canadian Heritage Foundation exist in Toronto. In his essay “What the Present Has Brought Us” (which is the first chapter of A Place Called Heaven as well as a de facto summary of the various issues Foster explores in that novel), Foster is attending the season’s final meeting of the African-Canadian Heritage Foundation, a group of parents who gather every Saturday in a Toronto School Hall to prepare their offspring for life in what many of them consider an alien culture. These parents are actually running a complementary school program, taking the responsibility to fill in the blanks about African people in the official school curriculum. On this day, the parents want to show how far their children have come toward achieving this goal of self-education . . . This is a seminal part of the responsibility of being black in Canada: to rely on no one, not even the school system that collects your taxes or even the federal government, which preaches unity through diversity (17). This dual education—the standard classroom instruction, developed by Euro-Canadians to provide basic educational skills and transmit a Euro-Canadian heritage, and the African-Canadian Heritage School, meeting on Saturdays, to instruct Black students about their heritage—is also present in Sleep on, Beloved. The fact that Suzanne performs well at the African-Canadian Heritage School but fails miserably—indeed is programmed to fail—in the Euro-Canadian school system implies that irrelevant school curricula and indifferent and hostile teachers contribute to turning Caribbean immigrant children into social misfits. In addition to compensating for the ontological void that Black students experience in their study of the Ontario school curriculum, the African-Canadian Heritage School hopes to imbue them with the self-confidence required to negotiate “the double burden of being black, the meaning of a lifetime of discrimination;” of being always offered menial jobs; “of feeling judged by different and harsher standards at school, work and on the streets; . . . feeling spied upon and policed differently; . . . seeing virtually no reflection of [themselves] in the mainstream media and popular culture; having to deal with” expectations on the part of Whites “that to be Black means [destined] for failure or prison;” and of knowing that they will be dismissed as whiners “for speaking out against conditions that create these fears and expectations . . . ” (30). This catalogue is instructive inasmuch as it replicates the problems of the Morgan family in Sleep on, Beloved, which will be examined below. The essays in Confluences II continue the examination, begun in Confluences 1, of the exciting new writing that has emerged in Canada in the past few decades. Employing a variety of approaches and addressing the many concerns engaging their author-subjects—memory, history, and concentric identities; the subordination of Indian women; the exploitation of Afro-Caribbean immigrants; the “nowarianism” of Indo-Caribbean Canadians; the legacy of Japanese internment during World War II; historical Black experience and meaningful aesthetics; Chinatown as geography, repository, and inspiration—this new body of writing collectively redefines and challenges the idea of Canadian Literature. 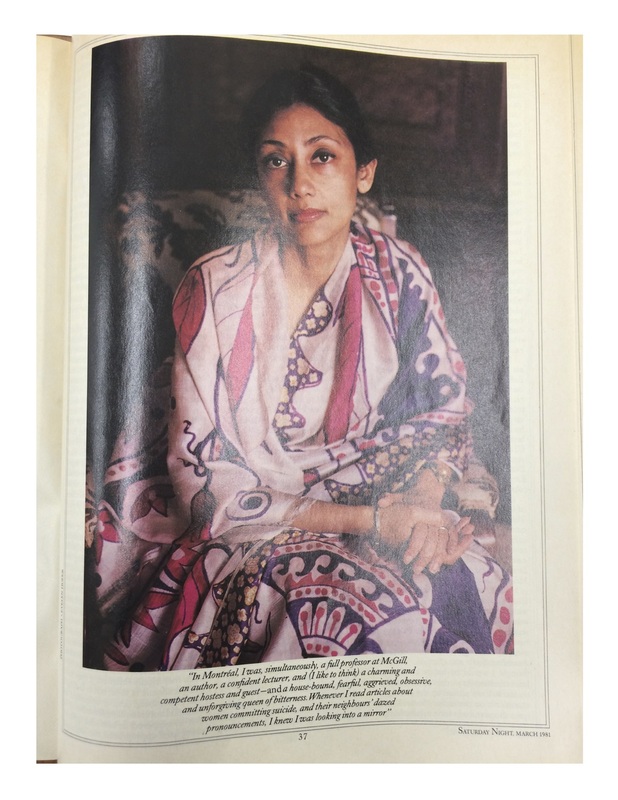 Nurjehan Aziz is the editor of Her Mother’s Ashes: Stories by South Asian Women in Canada and the United States, and more recently The Relevance of Islamic Identity in Canada. She is the publisher at Mawenzi House. H. Nigel Thomas was a teacher with the Protestant School Board of Greater Montreal before joining the faculty at Laval University, Quebec, from where he recently retired. His published works of fiction include Behind the Face of Winter; Return to Arcadia; Lives, Whole and Otherwise; and When the Bottom Falls Out. Author Bharati Mukherjee wrote of immigrant lives. Special to The Globe and Mail, Friday, Feb. 10, 2017.
as it appears in Saturday Night, March 1981. I once had a conversation with Doug Engelbart, the inventor of the computer mouse and, I would say, most concepts in interactive computing. He predicted that one day we would have all our experiences delivered to our senses electronically. It sounded unbelievable back then, but it is much more believable now. Amazed to discover there are people, or at least computers, in 40 countries checking out this salon, and can even correlate these visitors with what I posted on any given day. Peak time to read salon posts is lunchtime, between 12 and 2 p.m. And the number of visitors spiked on June 13th when I announced the publishing company.